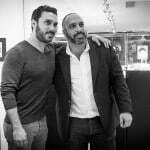 I got the opportunity to stop by Antiquorum Geneva and check out the watches in their upcoming November sale. I am luckily based in Geneva and enjoy walking over to see in advance what is coming up for sale. Antiquorum typically has large catalogs and in May of this year, they had over 620 lots to look through, which means it takes a while. 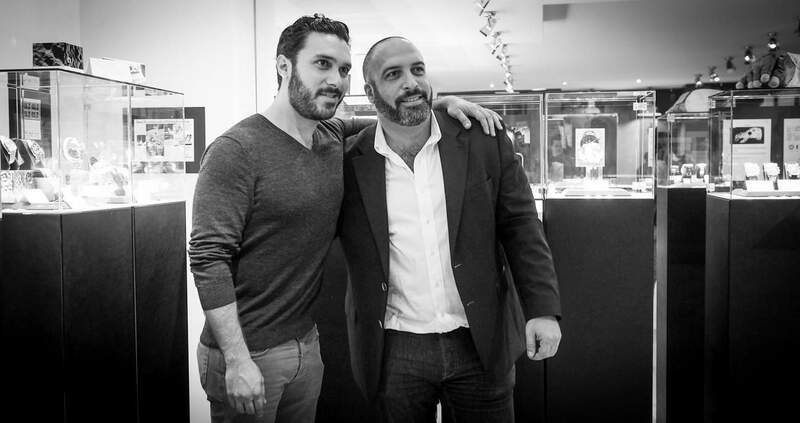 To take a look at the Antiquorum Geneva online catalog, you can click directly here. This Antiquorum watch auction, which takes place on Sunday, November 11th in Geneva, is comprised of 571 lots (less than the previous sale). There is a wide variety as always and some gems hidden in the thick catalog. I decided to take a totally different approach this time and used a little discipline to choose my favorite watch of the entire sale. Yes, just 1 out of 571. 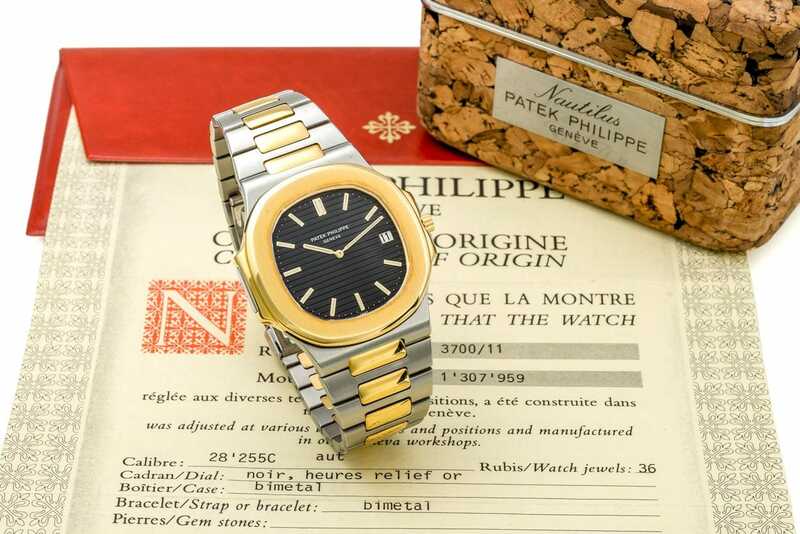 As I was pretty impressed by the fact they had so many, I was thinking to mention one of the 3 yellow gold Patek Philippe Nautilus 3700 they have with original papers or even the 3700 steel & gold with cork box and papers. Surprisingly, no 3700 in steel. Still, I definitely recommend to have a look at those and certainly to keep an eye on results as Nautilus has been bullish, to say the least (GOLD – Lots 182, 228 & 523 / Two-Tone – Lot 342). There is also a cool pair of Bulova chronographs, but I’m staying disciplined and we’re going to keep this article short … for once. One of the things I love about Antiquroum Geneva sales is that there is always a fresh original owner “drawer-find” to be discovered. 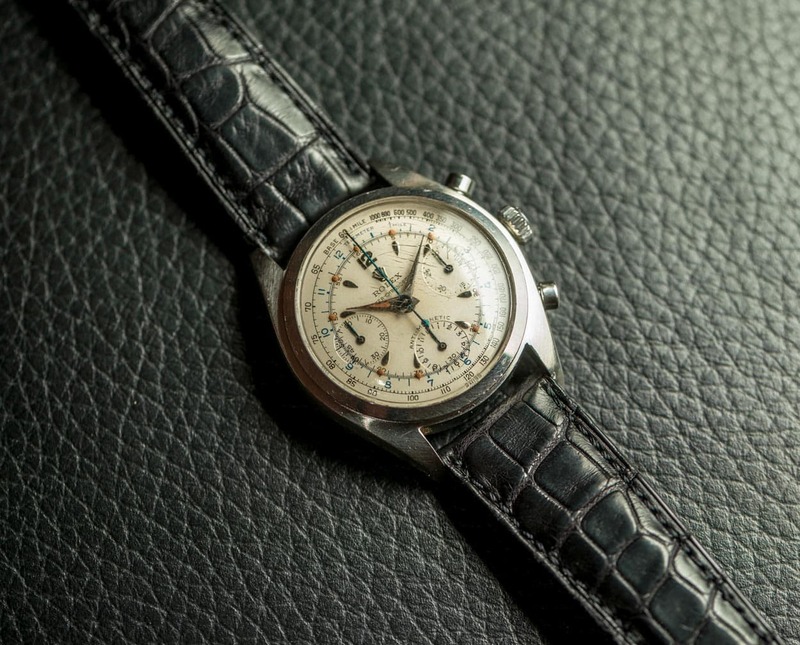 In this case, it is a beautifully preserved early screw-back Rolex chronograph 6034: The great-grandfather of the Daytona. Dating back to a short run in the early 1950’s, it is the predecessor to the 6234, that gave way to the 6238, which eventually became the Daytona 6239 in 1963. 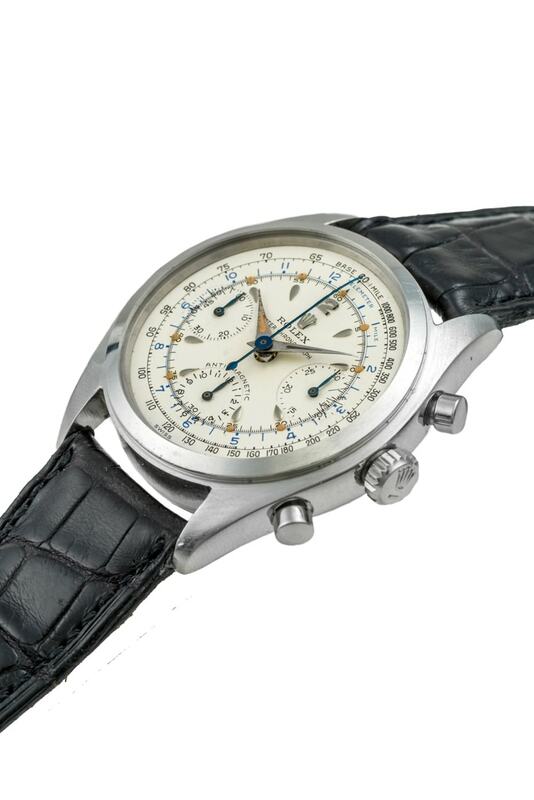 The vast majority of 6034 chronographs have tachymeter and telemeter scales on the dial. They were fitted with a Valjoux 72 base caliber, usually finished especially by or for Rolex and named 72A. In addition to a robust screw-back (we loosely use the waterproof) case, these dials and the presence of luminous radium indexes and luminous hands indicate this wristwatch was not intended for just looking cool at the office. 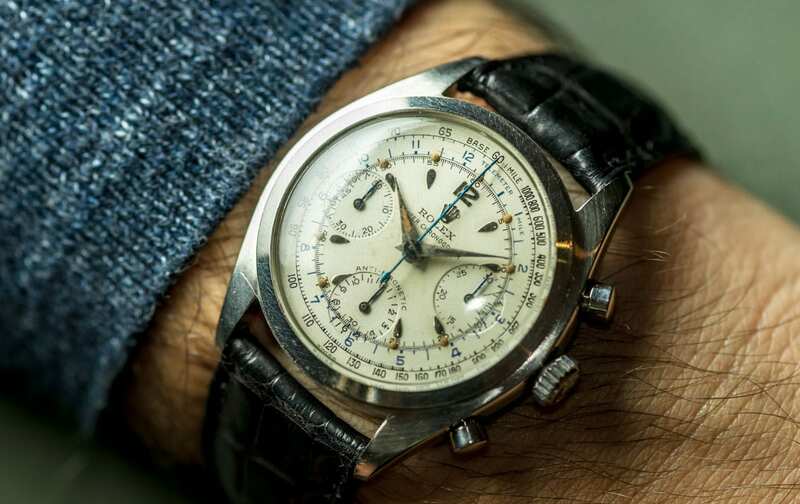 Although it maintains a spirit of 1940-50’s chronographs, there are elements of this watch that are quite technologically advanced for the early 50’s. Now that we have established that I find this model to be interesting, why don’t we move on to why I chose this particular piece to write about: the condition. I see a lot of watches every year. Just at these Antiquorum previews, I’ve seen over a thousand watches this year. I didn’t look at each in great detail, but I skim over a ton of things and very little catches my attention. This one was a ‘page stopper’ for me. It has that look of what it should look like with untouched dial and hands, perfectly preserved radium lume with fat plots on the dial and an unpolished splendid case. The acrylic crystal is crackled and original to the watch. One of those details that get us watch geeks extra excited. Overall, nicest 6034 I have ever seen in person and I will be looking forward to seeing the proper result for this one. For more information about this lot, you can find it here.